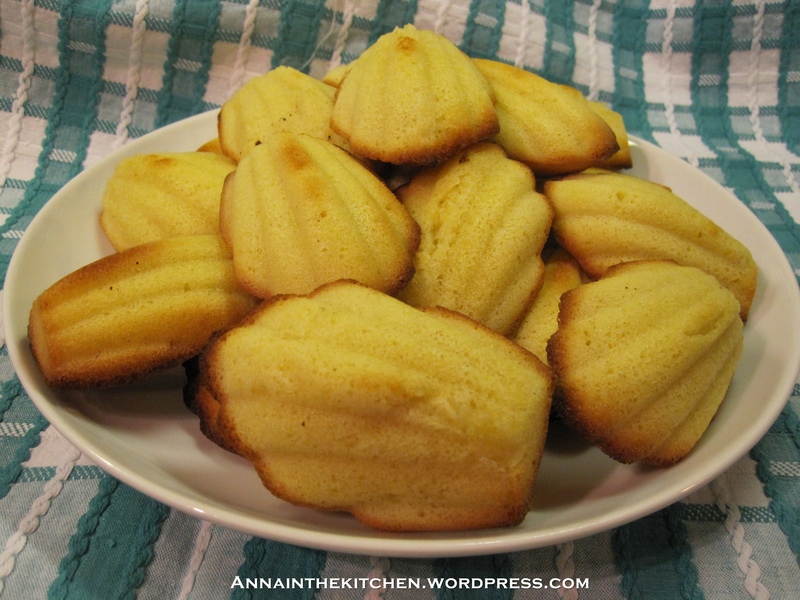 I’m not going to lie, you still need a madeleine tin to make these madeleines because without the cute shape it’s just a bun… a delicious bun but a bun none the less. However, with the cute shape you get everyone in your office cooing over how adorable these things are. So go out and pick yourself up a madeleine tin, or if you really don’t want to get a tin for just one thing (despite how much I promise you will want to use it) then use something like the dreaded bun tin. Individual, bite sized and cute is what you’re after here. You will also need an electric hand whisk. Unless you have the arm strength and stamina of a god I really don’t recommend that you skip this one. I’m already a huge fan of madeleines but when I saw this recipe I had to try it because with this one they could be even easier! And then being me I went ahead and changed the recipe I’d found again. Madeleines are already pretty simple but this recipe of mine is great. Easy to remember proportions, it makes a decent number of madeleines (and I’ve proven time and time again that I’m powerless to resist the lure of a freshly baked madeleine… or 5) and an even better discovery. You can make the mixture ahead and then leave it in the fridge for 24 hours! Just imagine, freshly baked madeleines for breakfast on a weekday! Not that the recipe said that but unfortunately as I was heating the oven, having made the mixture, we ran out of gas. We use bottled gas and changing a gas canister at 10:30pm is just not going to happen. So I had to stick the bowl in the fridge and pray. I got it out the next night after work and set to. They came out wonderfully! I was so surprised given that the rise comes from the volume you put into the egg and not a raising agent in the flour. I suspected that they would sink but the mixture only started to lose volume once I broke into it and started putting it into the moulds but even then not by much. – In a large bowl whisk together the sugar and eggs using a handheld electric whisk until pale in colour and more than doubled in volume. The mixture will go thick and the whisk will leave a trail. – Pour in the butter and the flavouring and mix until just combined. – Rest the mixture for 10 minutes to 24 hours*** and heat the oven to gas mark 7 while you wait. – Brush the madeleine mould with a little leftover melted butter. – Put a spoonful of mixture in each mould. – Bake for 10-12 minutes until golden brown around the edges. – Turn out to cool on a wire rack. – Brush the mould with butter and repeat the steps above until you have no more mixture. * I put the block of butter in a microwavable jug or dish, cover it and microwave it on high for 1 minute then give it more in 20 second blasts until it is all melted. ** I actually use a balloon whisk for these stages as it mixes in quicker so you mix less. *** Or perhaps even longer, probably not more than 48 hours though. If only I had those tins I would make these, they look yummy and perfect for special occasions when one wants to impress a little 😛 And the recipe seems really simple as well! It was worth every minute of trouble I had hunting down that tin! I love it! I eventually found mine on ebay and I’m glad I forked out for it because they are so little effort for such a great looking little cake. I looked around a little on ebay, and found one from the UK ebay that cost £9.99, and with free international shipping (and that shipped to Norway). I might try that one… I guess one could use the tins to make other pastries? I’ve been trying to think of things I could use my madeleine tin for other than madeleines and so far I’ve basically come up with things you might want to shape into cute little shells for fancy dinner parties like pate, sorbet, jelly (less fancy but still great!) or even cheesecake bites. I haven’t tried anything else in mine yet but I’m quite taken with the idea of using it to make little scallop shaped smoked salmon pates as a starter some day. I might try doing onogiri (riceballs) in mine as that would be cute too. Yay! You won’t regret it, they’re just so adorable! And we all know that cute food tastes better! Cute food does indeed taste better! Which is one of the reasons I like Japanese packed lunches (bentou)!